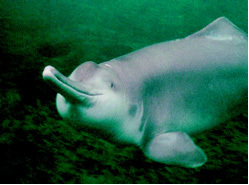 The baiji is a freshwater dolphin found only in the Yangtze River, China. It is pale blue to gray on its dorsal (back) side and white on its ventral (belly) side. It has a low, triangular dorsal fin, a long, upturned beak, and its eyes are very small, set high upon the head. Image credit: baiji.org. The baiji, also known as the Chinese River Dolphin and Yangtze River Dolphin, is a freshwater dolphin endemic to the Yangtze River in China. Baiji are usually found in pairs and may aggregate to form larger social groups of 10 to 16 individuals. They feed on a variety of small, freshwater fish, using their long, slightly upturned beak (or rostrum) to probe the muddy river bottom. Due to their poor vision and the murky waters of the Yangtze River, baiji rely on sound for communication, orientation, and feeding. Baiji whistles consist of a narrow-band tone burst with an upswept frequency modulation. Dominant whistle frequencies are around 5.8 kHz, with vocalizations lasting about 1 second. The frequency for the baiji’s click (about 60-110 kHz) is lower than that of the bottlenose dolphin (about 110-130 kHz). It is also much lower than that of the finless porpoise, another freshwater cetacean that occupies the Yangtze River. Since the two species live in the same habitat and are often found swimming together, researchers believe that the baiji and finless porpoise may use different click frequencies to avoid overlapping or masking their echolocation signals. Also, the finless porpoise eats smaller fish than the baiji, and may therefore need a higher frequency click to locate and identify their prey. In 1992, the Institute of Hydrobiology (Wuhan, China) built a baiji conservation dolphinarium. Only one baiji, a male named Qi Qi (shown here), survived captivity. He was rescued in 1980 and spent more than 22 years at the Institute. Qi Qi was the last known living baiji, dieing in 2002. Photo credit: Xiaoqiang Wang. International Union for Conservation of Nature, http://www.iucn.org. The baiji is on the verge of extinction, primarily due to human activities. Up to 5,000 baiji were estimated to live in the Yangtze River in the 1950’s, 300 in the mid-1980’s, and then only 13 individuals were sighted during surveys in the late 1990’s. The primary threat to the species is bycatch. Other threats to the baiji include pollution, dams, vessel collision, and prey depletion. It is generally concluded that the species is very close to extinction or may already by extinct. 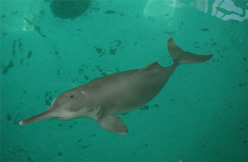 In 2006, an international team of scientists declared the species “functionally extinct,” as no river dolphins were seen during a 6-week survey throughout the Yangtze River. Even if a limited number of baiji are alive, scientists do not believe there are enough to sustain the population. University of Michigan, Museum of Zoology, Animal Diversity Web.